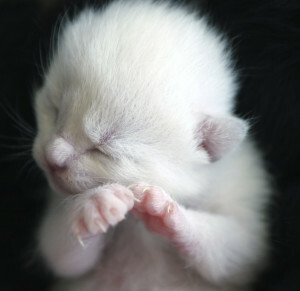 Purring in cats first occurs at about one week of age. 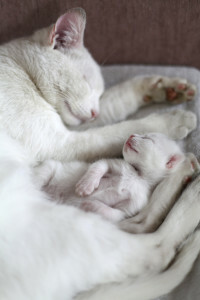 It serves as a signal to the nursing mother cat that all is well with her babies and that the milk supply is reaching its destination. She, in turn, purrs, letting the kittens know that she too is in a relaxed and cooperative mood. It is believed that purring between adult cats and humans is derived from this primal parent-offspring context. Contentment is not the sole condition for purring, however. A more precise explanation is that purring signals a friendly social mood and can be employed by an injured cat to indicate the need for friendship. It has been observed that cats in great pain often purr loud and long and can hardly be considered to be contented.